You are currently browsing the tag archive for the ‘GU Authors’ tag. 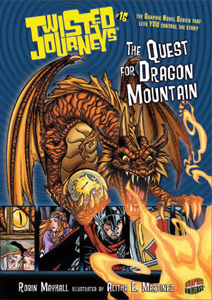 Robin Mayhall is the author of Twisted Journeys #16: The Quest for Dragon Mountain, the new adventure for Fall 2010 (along with Twisted Journeys #15, Agent Mongoose and the Attack of the Giant Insects). In The Quest for Dragon Mountain, illustrated by Alitha Martinez, the reader gets to be the dragon and decide what to do about pesky peasants, knights spoiling for a fight, and the promise of adventure and hoards of gold on a perilous quest outside the deep, dark dragon lair. Robin is currently writing a book for our exciting new YA graphic novel series that will debut in Spring 2011. Robin graduated with honors from the University of Texas at Austin with a degree in journalism and lives in Louisiana. That depends on whether I answer for fiction or nonfiction. I’ve been writing in some form or fashion since I was a kidI always wanted to write, and I always knew I would write in some way. I went to college in another state, about 500 miles away from home, but I came home for the first two summers and tried to get part-time jobs to make a few bucks. The first journalistic articles I was paid to write were for a local sports magazine called Tiger Rag. I wrote an article about the Louisiana State University cheer leading squad, which had just won a national championship. During my interview with the coach, I met the young man who had just been selected to dress in costume and play the LSU tiger mascot at the next fall’s football games. He was a wonderful, charming person, and he was tragically killed just a couple of weeks later in a car accident, before he ever got to play Mike the Tiger. It was terribly sad and made a big impression on me. The first item of fiction that I was paid for was a poem published in an online zine of speculative poetry and fiction called Strange Horizons. That poem ended up being nominated for an international poetry award given by the Science Fiction Poetry Associationa huge thrill for me! Right now I am really into writing poetry, particularly science fiction or “speculative” poetry. It’s hard to describe exactly what that means, but my poetry tends to have a lot of astronomy themes, focusing on stars, comets, constellations and other stellar objects, as well as on fantasy elements such as vampires, mermaids, faeries and the like. I really like the fact that I can express a thought, a vision or a succinct emotion in a poem very quickly without having to develop more of a plot and characterization. Although I also write short stories and longer fiction, there are times when I just have an idea or a play on words that I want to “let out”without a lengthy process. Q. Do you write full time? I do write full timesometimes it seems like I write almost 24/7! But I do truly love it. As I mentioned earlier, I have been writing as long as I could clutch a crayon in my stubby little fist. I started reading and writing very young, and it seems like from early childhood on, I devoured books and I wanted to express myself that way, in words. I feel blessed that Lerner and Graphic Universe have provided me with an opportunity to do that and to work with talented artists, too. 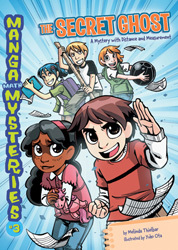 Melinda Thielbar is the primary author behind Manga Math Mysteries, our series for Grades 3-5 that relates math to everyday life through the eyes of the students at a Kung Fu dojo. Melinda is a statistician who has previously worked as a math teacher “in real life”. What was the first thing you were paid to write? Manga Math is my first paid writing gig, which is awesome and has probably spoiled me for other publishing houses. Everyone I’ve worked with has been professional, helpful, and focused on making the books their very best. What’s it like working with an artist? Do you write full time? If not, what else do you do for a living? Do you want to write full time? I was actually chosen to write Manga Math because of my experience teaching statistics and mathematics. I’m now working as a consultant for a statistical software company. One of the really exciting projects I’m working on is saving the wild tiger with statistics. There is a group called WildTrack that uses animal footprints like human fingerprints to track endangered species. Two weeks ago, I got to stand outside a tiger’s cage and feed him treats. We were trying to get him to walk across a nice sandy spot so we could take pictures of his footprints. Of course he wouldn’t do it, but he appreciated the treats. I love my job as a statistician. People are always excited to see me and have my help, and they’re more than happy to tell me all about their interesting projects. I have many friends who are full-time writers, but overall I think it’s not for me. Writing as a full-time profession often means writing things that are profitable rather than things that move you as an artist. Having a day job gives me the freedom to write what I want to write. It helps that my day job is one of the coolest jobs around! Have you ever written someone you know into a story? Perhaps at their insistence? Most of the Manga Math characters are based on my kung fu brothers and sisters. No, I won’t tell you which ones. Amy is actually named after Amy Lau, a writer from New York and a classmate from one of my writing workshops. Amy helped me with a lot of research for a novel I’m working on, so it seemed only right that I make her a character in one of my Graphic Universe books. Paul D. Storrie is the author of many Graphic Universe books, including several volumes of Twisted Journeys (#03 Terror in Ghost Mansion and #05 Nightmare on Zombie Island) and many of our Graphic Myths and Legends books (Amaterasu, Beowulf, Hercules, Perseus, Robin Hood, William Tell, and Yu the Great). He has also penned a book for our mysterious new graphic novel line. Paul’s mysterious new book will be released in the Spring of 2011. Robyn of Sherwood, a comic book starring the daughter of Robin Hood. Q. What’s your favorite genre to write in? What type of writing do like best – long, short, fiction, nonfiction? I’m pretty exclusively a fiction writer. For some reason, nonfiction just doesn’t appeal to me. Picking a favorite genre is difficult. Most of my stories have a strong action/adventure vibe, but they’ve taken the form of historical fiction, mystery, fantasy, science fiction and more. If pressed, I’d pare my choices down to hard-boiled detective fiction or sword & sorcery. Q. Did you start off writing prose and switch to comics or vice versa? What’s it like working with an artist? Have you ever been surprised how your artist(s) see your characters or world? Professionally, I started writing comics and have branched out into prose. I think I wrote prose first as a kid. Working with an artist is generally an incredible experience. Although you can be surprised by how much an artist’s vision of the world and characters differ from your own, the most astonishing thing is when you seen an artist’s work and think, “That’s it! That’s exactly what I was thinking!” I love that feeling. Some of my friends and family would claim that I don’t have to get into a kids’ mindset, I’m there everyday! Mostly what I do is think back to what I loved when I was the age I’m writing for and try to recapture some of the wonder and excitement that I experienced back then. Also, I try to remember that kids are a lot sharper than we sometimes give them credit for and make sure I’m not oversimplifying or writing down to my audience. Q. If you write for Twisted Journeys or another series with a relatively strict structure, what is it like working within that structure? Generally speaking, there’s a somewhat restrictive structure writing most regular comics. Most often, there’s a specific number of pages and you’ve got to make sure you’ve got enough story and not too much to fit. The Twisted Journeys books take that to another level, where there are a certain number of different kinds of pages. The first thing I did when I started my first Twisted Journeys book (Nightmare on Zombie Island) was to count out how many pages any given story path might have. If I’m remember right, the longest was only 32 pages (including ‘choice’ pages). That’s not terribly long, so it was important not to try and squeeze too much story into that space. The most important thing working with a strict structure is to embrace it, to try and pick a story that works best within that structure. It’s like the old saying about not trying to fit a square peg into a round hole. Sometimes. Sometimes they mistakenly think I’ve got big boxes of books laying around and expect me to give them free copies! I don’t think I’ve ever written anyone into a story. Sometimes I’ve used names (usually first names) of friends or family. Sometimes I’ve written a character inspired by someone I know. I tend to avoid adding real people into my work because I wouldn’t want them to be angry or disappointed if they thought I hadn’t portrayed them correctly. The most complete list is on my website, storrieville.com, on the bibliography page. Even though it’s probably the shortest project I’ve ever written, I’m really proud of my contribution to Marvel’s Captain America: Red, White & Blue anthology. I got to write my favorite superhero in a story set in my hometown of Detroit and it was illustrated by renowned artist David Lloyd (who drew V for Vendetta) and colored by the very talented Chris Sotomayer. I can’t listen to anything where the words distract me. That means I tend to put on movie/TV soundtracks or music that I’ve heard so often that it blends into the background. I like listening to NPR, but I can’t do so while I’m writing. I guess because listening to a conversation engages the same part of the brain that’s used for making up conversations between imaginary people! I envy my artist friends who can listen to podcasts or watch TV while working. Q. This is a total cliché question, but do you have a favorite comic writer or prose writer? Who are your influences? My favorite comics writer when I was growing up was probably either Steve Englehart, whose work on Captain America I particularly enjoyed, or Roy Thomas. I think their work probably influenced mine a great deal. One of my favorite prose writers is Loren D. Estleman, who writes mystery/crime stories set in Detroit, as well as westerns and historical fiction. My influences, in addition to those gentleman, include mystery writers Dashiell Hammett and Raymond Chandler, fantasy writers J.R.R. Tolkien, Robert E. Howard and Fritz Leiber, and science fiction writers Poul Anderson and Gordon Dickson. Plus Howard Pyle, whose Merry Adventures of Robin Hood is responsible for my lifelong love of the bold outlaw of Sherwood. Q. Which college did you go to and what was your major? I graduated from Grand Valley State University in Allendale, Michigan with a Bachelor of Arts in English Language and Literature. I thought about majoring in Creative Writing, but decided to go for a broader approach. Also, I took a lot of art classes, though I was a few credits shy of getting my minor in Fine Art. I’m planning to attend the Chicago Comics and Entertainment Expo in April and the Kids Read Comics Con in June.